Veratran® D Insecticide is the only crop protection product in the U.S. using Sabadilla alkaloids as the active ingredient. First discovered centuries ago by the Incas and Aztecs, Sabadilla has been a reliable botanical option to effectively control insects ever since. Today, Sabadilla is used as the active ingredient in Veratran D to control thrips on avocados, citrus and mangos. Veratran D can be applied via air or ground and may be re-applied as needed at 10-14 day intervals. Is Veratran D an organic product? 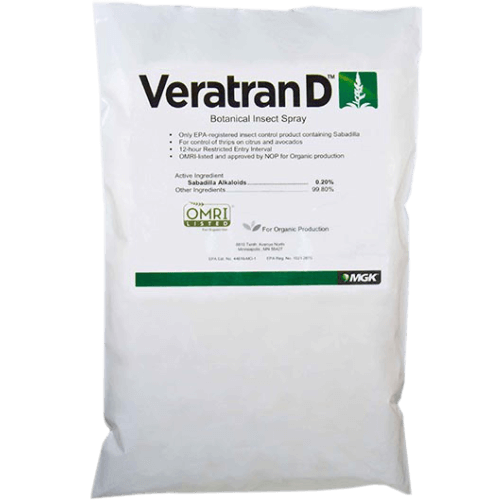 Yes, Veratran D is OMRI listed, which means it can be used for organic production.